A small module that controls camera on/off and shutter. This makes a time-lapse or remote controlled camera out of just about any low cost off the shelf point and shoot camera. What’s it good for ? The whole idea is that it’s relatively cheap and you can leave it in place outdoors for some time. Wildlife and security monitoring are high on the list. But it can also be used to record things happening over a long period. Like erosion, plant or crop growth or recording experiments. Low cost means that it can be left outdoors or in a concealed location for extended periods were there is a possibility that it will be lost or damaged. Low cost means you can use two or three to get multiple angles or to find out who stole the first one. Because the controller is separate, it can be connected to different types of camera. Many low cost cameras are available but some are better in bright light or have different features. This allows a low cost camera to be chosen that still suits the purpose. The controller has 2 outputs that connect to he cameras power button and shutter button. The controller turns the camera on, waits for a short delay, takes a photo, waits for a short delay and turns the camera off. The camera has its own battery and can power the controller, or the controller can have its own battery. The camera battery can be backed up by an additional external battery for longer duration operation. The trick with this system is that it requires breaking into the camera to connect the control signals. The great thing about it is that you can use a cheap camera and with the low cost controller, it’s not a huge worry putting it out in the wild somewhere. Which cameras can be used ? The problem with cameras now is that the feature list is growing but the usefulness is not. Lots of new features and they still don’t quite do the job. For a camera to be suitable it must switch on with known settings. However you set the camera before turning it off is how it should be when turned back on. This usually means flash disabled etc. It should also have a fixed lens with fixed focus. You don’t want the lens zooming in and out chewing up power and wearing itself out for a stationary camera. You will also probably need good low light performance or a longer shutter time. Finding a good camera involves a bit of trial and error, but since we’re looking at low cost cameras with few features it’s not too much of a problem. I have found that the big-name brand cameras are the least useful. They tend to have better optics and sensors but their feature lists, custom connectors and some weird attempts to lock them down makes them more trouble than they are worth. The controller uses very little power and can last for months on a 3V coin cell. Most of the power is used to run the camera. So this depends on the camera and how much room you have available for batteries. Since we are breaking into the camera to connect the controller, it’s not a problem to connect in an external battery. Usually a lithuim battery that can be recharged between uses and has a low self-discharge rate. The rate at which pictures are taken also affects battery life. For a busy area you may need more pictures, but for watching plants grow, you may only need a picture every hour. 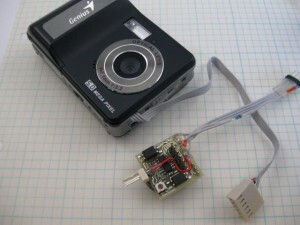 The prototype has been in use for over a year with a 5MP Genius G-Shot D501 camera worth about NZ$80. This has been powered using two 2000mAh NiMh AA cells in the camera and a 2200mAh LiPo on the controller and the controller supplementing the AA cells in the camera. This is good for 4-7 days at one photo every 2 minutes. 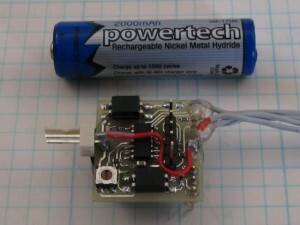 The white 2-pin connector is where the LiPo battery connects. The prototype has pin connections for the programming interface and a PPM control signal that are not normally used. Installed into a small plastic water proof container with a clear window and lens cover, it has worked well outdoors. The camera is set for flash-off and night-mode and left running day and night. The camera is modified to bring out four wires; 3V power (+ and -) and a wire for each of the power button and the shutter button. The controller also works with a modified Samsung PL50 10MP camera on a model plane. This camera has auto-focus and a zoom lens. In this setup, the controller leaves the camera powered and takes a picture every 30 seconds. This camera would be good for long term monitoring where there is some time between photos to minimize wear and tear on the lens etc. with frequent cycling. It’s a better camera for night time. I did get a second Genius D-501 but fond that they had changed the menus and some basic operation making it much less useful. On the bottom label there is a small note mentioning it’s a V2 model. The V1 was much better.